Infographics are all the rage these days, and personalised infographic generators are starting to make their mark too. 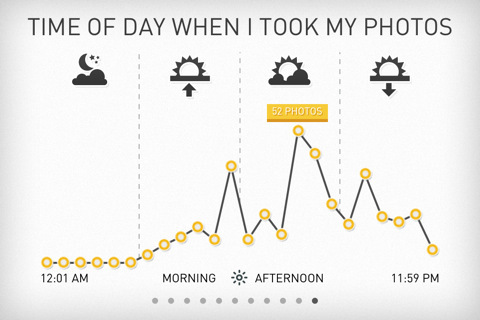 A good example of this is Photostats, a new app from Swedish developer Dear Future Astronaut. Using the app is pure simplicity. Fire it up and it will analyse the photos stored on your iPhone and build a number of neat infographics from them. 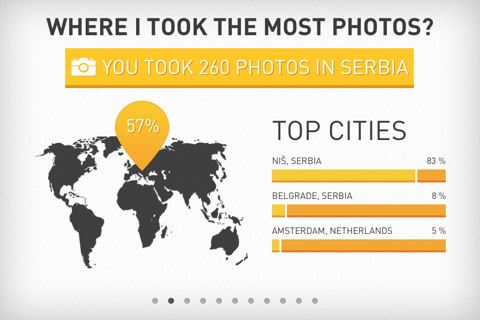 The locations they were taken in; the proportion of photos to other images stored on your phone; the amount of memory taken up by photos; ISO values; use of the camera flash; average shutter speed; your most productive photography days; your favourite photo-taking app; your preferred image orientation, and the times of day you take photos – all these stats get the visualisation treatment. Each individual graphic can be shared from the app via Twitter, Facebook and email, or saved to your phone for future use. You can also generate one big infographic that includes all the stats in one image. 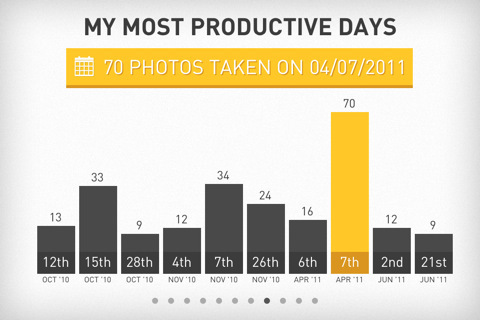 Photostats is a simple app, but does what it does with style. It’s available now in the App Store for 99 US cents or local equivalent.